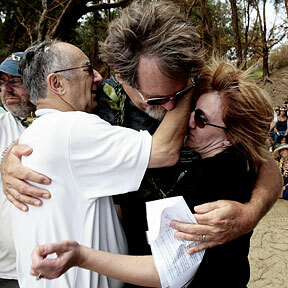 KAUAI VICTIMS REMEMBERED: Bruce Fehring, center, comforted members of Wayne Rotstein's family -- brother Gary, left, father Paul and sister Sandy -- on Kahili Quarry Beach in Kilauea, Kauai, yesterday during a service to honor the seven people killed in March in the Ka Loko Dam break. Public-housing advocates are watching closely as a beleaguered bureaucracy prepares to split. Waving goodbye to a Waikiki icon. UH reaches 40 wins and finishes second in the WAC. Bobby Jones Dacanay can sell you a bicycle and later fix it for you, too. A Kona coffee industry group, at odds with farmers, wants the state to impose regulations on the growers. A federal advisory panel has recommended approval of a vaccine that could greatly reduce death from cervical cancer.